Jersey's Olivia Jordan-Higgins has edged closer to a place on next year's LPGA Tour after coming runner-up in the Symetra Classic in North Carolina. She hit a final-round 68 (-4) to finish on seven-under, just one shot behind South Korean Mi-Hyang Lee. It moves Jordan-Higgins from 21st on the money list to 12th with two tournaments of the Symetra Tour remaining. The top 10 at the end of the season qualify for the LPGA in 2013. "I played well all weekend it was just a matter of the putts dropping, which they did on Sunday," said Jordan-Higgins. "I knew that I just needed to focus on the job in hand and not worry about what everyone else was shooting." 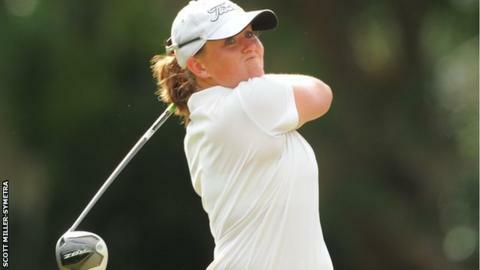 Her second-placed finish at Raintree Country Club was her joint best ever. She also came runner up in August at Albany. Her performance in Charlotte takes her total earnings for the year to $29,122, just over $1,000 behind Leah Wigger who holds the 10th spot. "I am very excited at the possibility of being on the LPGA next year," said 23-year-old Jordan-Higgins. "However, I need to just focus my attention on the final two events and leave that up to fate." The final two tournaments of the season see Jordan-Higgins compete in the Vadalia Championship at Hawk's Point and the Daytona Beach Invitational.